It's a weird feeling, being unhappy taking only a point from a 3-0 deficit. By this point, plenty of digital ink has been spilled on the topic, about how Arsenal didn't show up for the first 70 minutes, so clawing back from 3-0 down to draw 3-3 feels more like "well, yeah, but what if you played like that for 90 minutes?" Meanwhile, Chelsea lost and Liverpool drew, so not all is bad. I know I'm not the only Gooner out there who is at least a little glad Tottenham snapped Chelsea's winning streak before they could break Arsenal's 2002 record. It's funny, Chelsea beat Spurs back in November to end Spurs' unbeaten run to start the year and now Spurs have beaten Chelsea to snap their winning streak. I think that all evens out nicely for us, doesn't it? So, it's two points dropped, even from 3-0 down, but Arsenal managed to claw back a point in their deficit behind Chelsea at the top of the table while also simultaneously falling into fifth place. But we'll worry about that when league play starts up again next weekend. Meanwhile, we've got the FA Cup to contend with and it's a trip to Lancashire to face Preston North End, who are 11th in the Championship. Mid-table Championship sides can often be a tricky lot to face in the cup; a team at the top or bottom of that table might be more focused on their promotion or relegation fight, respectively, but a mid-table side will see this as a chance for a famous victory. I'm not sure how I feel about this one. Okay, there's a lot going on here, so let's take this position-by-position, shall we? Arsène Wenger has already come out and said David Ospina will start in goal, so that takes care of that. On the backline, there are injury concerns over both Hector Bellerín and Laurent Koscielny; the former played through a knock on Tuesday and the latter came out of the match as a precaution. Koscielny's injury was described as "two problems" with his thigh, so he will not make the 18-man squad. Expect Gabriel to play in the middle with Rob Holding. It's harder to tell with the fullbacks, because I'm not positive if Kieran Gibbs is ready to return from the knee injury he picked up on Boxing Day. Francis Coquelin injured his hamstring and will be out three to four weeks, which is perfectly timed with Mohamed Elneny's trip to the Africa Cup of Nations. Aaron Ramsey may have to play in the deep-lying role along with Granit Xhaka for a while, but we're one red card away from needing to put an actual traffic cone in the holding role. The prognosis on Santi Cazorla, meanwhile, is getting worse instead of better. Mesut Özil is just coming back into training now, having been bedridden all week, so he will not feature. Alexis Sánchez will be rested as well. Lucas Pérez picked up an ankle knock against Bournemouth, so even he makes the doubt column, but we could get an appearance off the bench from Danny Welbeck. We're getting into serious LANS territory here. I won't predicted an XI for this because there might be a lot of fringe and youth players coming into the side and, honestly, Arsenal can't run the risk of losing any more players right now. Former Leeds striker Jermaine Beckford was sent off against his former side on Boxing Day, making it two consecutive matches in which the striker saw red. The story here is pretty astonishing: on December 5, Beckford and his teammate Eoin Doyle were both sent off for fighting with each other during injury time of Preston's 2-1 loss to Sheffield Wednesday. After serving a three-match ban, Beckford returned against his former club and after five minutes, kicked out at former Arsenal center back Kyle Bartley, catching him in the face while both were on the ground following a collision. Midfielder and vice-captain John Welsh (who isn't even Welsh!) and defender Calum Woods are both injury absences for Simon Grayson's side. It remains to be seen how much Preston might rotate for this match. They may go with their usual league squad if they feel like they can win it, but they did rotate for the League Cup earlier in the season. Hey, remember when Arsenal were unbeaten in 19 matches across all competitions earlier this year? Well, since that streak, they have won five out of nine, losing three and nearly losing the fourth before storming back from three goals down on Tuesday. After this match, Arsenal's next three league fixtures are against Swansea, Burnley, and Watford before heading to Stamford Bridge, so they'll really need to snare all nine points to keep their head above water in the table. Meanwhile, Preston have only lost four of their last 19, dating back to a 5-0 loss against Brentford in September, but seven of the remaining 15 matches were draws, including a League Cup tie they won on penalties against Bournemouth. This streak has come after the club lost six of their opening 10 matches, but it still leaves them in 11th place in the Championship. With 36 points, they are six points back of Sheffield Wednesday for the final playoff spot and 16 points out of the last automatic promotion slot. At the same time, they are 12 points clear of relegation. If they turn these draws into wins in league play, they might have an outside shot at the promotion playoffs, but it looks like they'll be sitting comfortably mid-table by season's end. Arsenal have not played Preston since a League Cup tie in October of 1999, which Arsenal won 2-1 at Highbury. Preston have not been in the top flight since 1960/61, when each side beat the other at home. For some reason, those fixtures were played a week apart in August of 1960 (later that year, Arsenal played both of their fixtures against Sheffield Wednesday over the Christmas period, on the 23rd and 26th of December.) Must have had something to do with travel? The sides have met in four previous FA Cup ties, with each side advancing twice. Each side has won once on the first attempt and once in a replay. 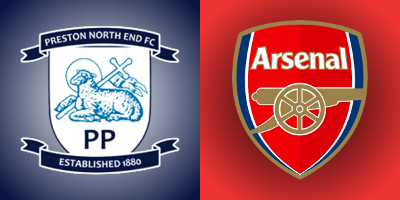 Arsenal have won the last two cup ties between the clubs, winning 4-2 in Preston in 1999 and winning 2-1 in a replay after drawing 3-3 in Preston in 1957. Preston's wins came in 1922 and 1938. The referee is West Yorkshire-based Robert Madley. Madley has been seemingly fast-tracked for the top level of officiating, even at the age of 31, as evidenced by being tabbed for this television fixture. He has also worked a number of big fixtures this season, including Liverpool's trip to Tottenham and Tottenham's trip to Manchester United. He's worked one Arsenal match so far this season, which was the 2-1 win over Southampton in September, in which he awarded Arsenal a late penalty. The last time Madley worked a Preston match they were in League One and the date was April 11, 2015. Preston drew that match 1-1 at home against Bristol City. His previous Preston match was a 4-4 draw at Coventry City on August 25, 2013 which both sides scored in injury time. Coventry blew a late 3-2 lead, but Preston blew an even later 4-3 lead. I've mentioned this before, but Madley has the odd distinction of having shown three red cards in his first Premier League match; this seems strange on the face of it, but all three decisions were correct. John Painting is a contributing writer to the Modern Gooner and isn't even Welsh either! You can follow him on Twitter @zorrocat for a normal amount of consonants and vowels in each word.